In a previous spotlight I posted about Arsenal’s Wojciech Szczesny and that infamous mix up with Laurent Koscielny in the 2011 Carling Cup Final. However let’s not forget that in that match, even though Szczesny may not have been having the best of games, in the opposite goal, Ben Foster was showing the world just why he is one England’s finest keepers. Like Tom Heaton of Cardiff (also previously in one of my Goalkeeper spotlights), Foster was also a former keeper at Manchester United who like Heaton was unlikely to ever be first choice keeper at United considering the form of Edwin van der Sar (and then also to become third choice in the pecking order behind Tomasz Kuszczak). So like Heaton, Foster has had to move away from United to establish himself. Foster had a loan spell away from Manchester United with Watford, where he was described by the then Watford Manager, Aidy Boothroyd as “better than current Manchester United goalkeeper Edwin van der Sar”. With Boothroyd proclaiming that Foster “is going to be the best goalkeeper in the world.” High praise indeed, but then he did help Watford secure their promotion to the Premier league and was named Player of the Season the following year when on loan again with Watford. So after impressing on loan and with Watford and with Alex Ferguson also believing he had a potential talent, Foster eventually got the chance to take over from Edwin van der Sar at a time when van der Sar was injured. However, where as David De Gea at Manchester United seems to have been given the time to prove himself even after being slated by the press, Foster appeared not to have had such a grace period. 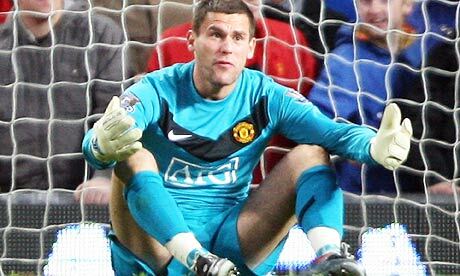 Like De Gea, Foster to seemed to be having a crisis of confidence.[http://www.guardian.co.uk/football/2009/oct/05/ben-foster-england-manchester-united]. But you have to hand it to Foster, even though being slated by the press, especially after the 2-1 defeat to France, Foster has dusted himself off and got on to show that Aidy Boothroyd’s comments were just. In addition to his Carling Cup winners medal and man-of the match, like at Watford, Foster was also deservedly awarded Birmingham’s Player of the Season! Even though Foster was in inspirational form it was not enough to keep Birmingham in the Premiership and with subsequent relegation, meant that Birmingham needed to look at sending out Foster on loan to help their wage bill. This has seen Foster go on loan to West Brom, with the option of signing permanently, should Birmingham fail in their bid to bounce straight back up into the Premier League. 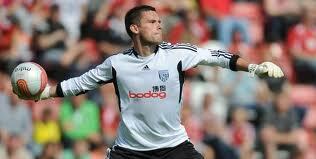 Birmingham’s loss is most certainly West Brom’s gain, as he is now their first choice keeper producing again exceptional goalkeeping prowess that is getting the praise he deserves, from his Manager, Roy Hodgson who has stated in the press of his desire to keep Foster permanently [http://www.sundaymercury.net/midlands-sport/west-bromwich-albion-fc/west-brom-news/2012/03/18/west-brom-roy-hodgson-praises-ben-foster-66331-30561771/]; and getting high praise from Alan Hansen on this weekend’s Match of the Day after producing a string of fine saves. Foster has most certainly grown into a great goalkeeper. An asset to any team… It now is not really a question as to whether he will pick up more awards, as with the form he is in, it is almost a certainty that he will be honoured again….The only question really for us, England fans, is how can we persuade Foster to join the England squad again? 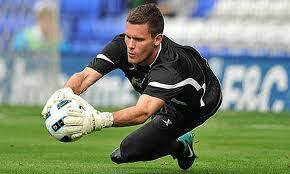 To have both Joe Hart and Ben Foster at future championships with England would be fantastic! 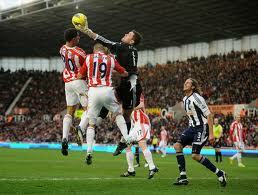 Posted on Tue 20 March 2012, in Goalkeeper spotlight, Goalkeepers, News Stories and tagged Aidy Boothroyd, Arsenal, Ben Foster, Birmingham City, Carling Cup, David de Gea, Edwin van der Sar, Football, Goalkeepers, Joe Hart, Manchester City, Manchester United, News, Roy Hodgson, Sport, Tom Heaton, Tomasz Kuszczak, Watford, West Bromwich Albion, Wojciech Szczesny. Bookmark the permalink. Leave a comment.